UFC president Dana White’s latest video blog showcases behind-the-scenes footage from UFC 165. It’s pretty much the standard stuff from White, but the in-cage and backstage shots that he got from the show’s featured attraction between light heavyweight Jon Jones (pictured) and Alexander Gustafsson is gold. As if it wasn’t obvious before, White was clearly impressed with Gustafsson’s performance against “Bones,” who was a whopping 9-1 odds-on favorite to steamroll the Swede. 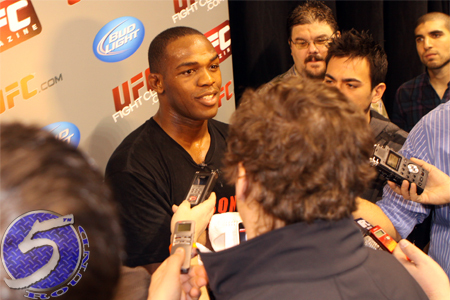 Jones wound up taking a hotly-contested unanimous decision victory to become the UFC’s most decorated light heavyweight champion with six consecutive title defenses. UFC 165 took place September 21 inside Air Canada Centre in Toronto.